The law faculty was opened in 1993. Since 1999-2000 at the faculty the magistracy on a speciality «Civil law, a family law, civil process, international law» was opened. Nowadays at the faculty 11 magistrants on speciality State law and management ( Constitutional law, Municipal and Bank law , History and theory of state and law)also 688 bachelor students get education. As a result of association of Law faculty and history faculties was organized History and law. On an extent with 1977 to 2008 deans of faculty were K.Saribaev , B.Shamambetov, I.Torebekov, E.Umarov, M Kydyrnijazov, B.Matmuratov, Z.Hakimnijazov, E.Kutybaeva. 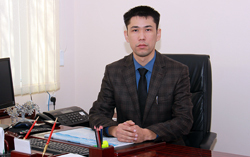 Since 2008 the dean of the faculty has been the candidate of Historical Sciences, associate professor Allamuratov A T.
5А240101 – State law and Management ( Constitutional law; Municipal and Bank law ; History and theory of state and law). Candidates of Science – 33.